Is it true that volunteering has good impacts for both employees and company? The answer is YES, employee volunteerism positively affects health and well-being of people who participate. According to a study titled Doing Good is Good For You, 75 percent adult volunteers feel physically healthier and a stronger connection to their employers by involving themselves in social activity. Almost all (93 percent) respondents said they feel a good mood after volunteering and 88 percent said that the activity does increase their self-esteem. Employees can also have a great control over their health and well-being by volunteering. Not only does volunteering good for the individuals, Pamela Hawley, founder and CEO of UniversalGiving and award-winning non-profit that connects volunteers and donors with quality service opportunity, said that volunteering has a good impact on the company. By setting up a volunteer program, company can increase its product value and visibility. The organisation will likely to stay competitive as volunteer can help attract and retain employees. Here are Pamela’s view on how volunteering is good for both employees and company. Not only volunteering is one of ways to break a monotonous work habit, it will also foster motivation in the workplace under precedent of working for an impact-minded company. It is also a great way to show your company’s vision and mission to employees and customers. By allowing employees to do volunteer job, your firm can be strengthened by the cohesive values that instills in your employee’s mind – and heart. In order to do so, you should first create volunteer opportunities based on your organisation’s goals. While this might sound simple, building opportunities can be done haphazardly. Your company value should be shown not just through formal communications and events, but also through actions of every person and employee who represents your company. According to millennial survey, 59 percent of millenials gravitated towards companies with pronounced Corporate Social Responsibility (CSR) program. CSR is about how your products are socially responsible, your leader and CEO are transparent, your company is honest, and your employee gives and volunteers. These qualities done by volunteering potentially attracts employees and could be the most factor that makes someone choose to work in your company. Another study from Cone Communities found that 74 percent employees said their job is more fulfilling when they are given chances to make a positive impact at work. Therefore, by using community service to help employees fulfil their dreams and accelerate their careers, you will see more enthusiastic employees. Thus, not only will it result to develop the company, but A-team’s eagerness will pay off in renewed engagement and loyalty. 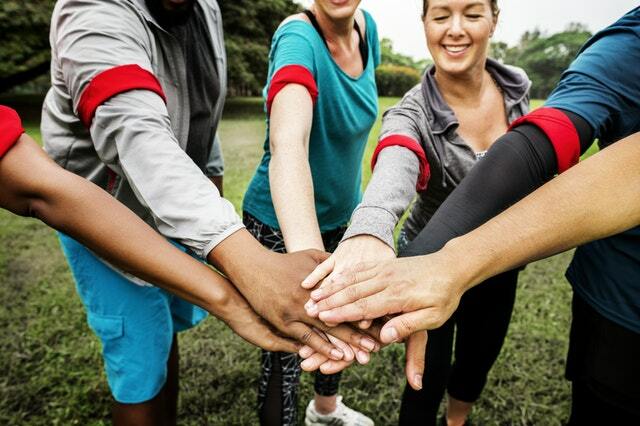 Corporate citizenship report found that team building is an extremely beneficial for company as it facilitates communication and collaboration. Volunteer, in this matter, can be a great way to bridge these kinds of teamwork. Employees can work together outside of the office and build relationships. Managers, on the other hand, can organise volunteer trips as team building exercises. The report shows that organising volunteer events can be some of the highest forms of team building and cross-business unit collaboration. Volunteering is one of good way to build product awareness as the community will see your company in a positive light. So, when they think of your company’s product, they will see all the good you do. Let local communities see beyond your company’s building, logo, and marketing. By doing this, community tends to see new light of visibility to your organisation. Thus, it can also highlight corporate presence and brand while helping company’s bottom line. Pamela suggests that in order to build a successful corporate entity, people should believe that their 12- and 14- hour corporate days mean something. As a result, you will see your company grow stronger and more resilient. It is a win-win solution as you help your business and community at the same time.